The Intel Kaby Lake-G family of processors and the form factors they enable are rather interesting to PC enthusiasts. 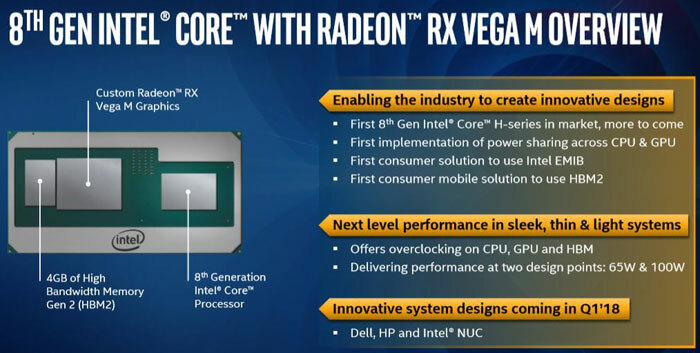 In the west we haven't seen many systems come packing one of these Intel 8th Gen Core & AMD Vega M SoCs yet. HEXUS reviewed the Intel Hades Canyon NUC (NUC8i7HVK) just 10 days ago, which is a rather pricy £860 here in the UK and it won an 'Approved' rating. Other than that there's the new Dell XPS 15 2-in-1 and the new HP Spectre x360 15 (2018), both priced around £1,700. It looks like, for now, we will have to rely on Chinese makers to create more accessibly priced Kaby Lake-G machines. Back in April we noted the Chuwi HiGame mini PC packs Intel's 4C-8T Core i5-8305G was in the works. Now there have been another couple of products, based around the Kaby Lake-G series, spotted in Hong Kong. Liliputing reports, via Notebook Italia, that Chinese device manufacturer Emdoor has unveiled several new PC designs featuring Intel's Kaby Lake-G processors. The company had two products on show; a mini desktop similar in size to the Intel Hades Canyon NUC, and a 14-inch laptop. It said that they are designed for gaming. Both run Windows 10. The Emdoor EM-B14KG mini gaming PC desktop weighs approx 1.5kg, and measures 262 x 172 x 52mm. Buyers can choose from various configurations - an i5 or i7 Kaby Lake-G processor, from 4 to 16GB of RAM, and between 64GB and 512GB PCIe SSD (0.5 or 1TB HDD option too). Connectivity is provided as follows; 802.11ac Wi-Fi and Bluetooth connectivity, 2x HDMI, 2x DP, 5x USB 3.0, 3.5mm audio jacks, and Ethernet. 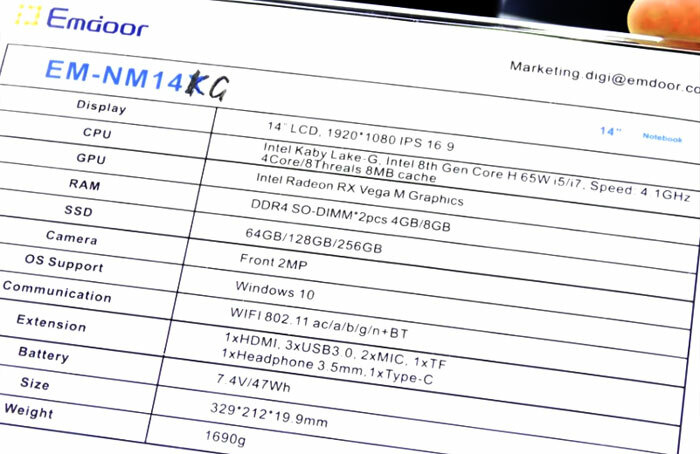 The Emdoor EM-NM14KG is a thin and light laptop built around a Full HD 14-inch IPS screen. It measures 329 x 212 x 19.9mm and weighs 1.69kg. Processor choices are the same as with the desktop however memory is reported to be a maximum of 8GB and storage a maximum of 256GB SSD. The laptop offer the following connectivity options; 802.11ac Wi-Fi and Bluetooth , HDMI, 3x USB 3.0, 1x USB Type-C2 , SD card slot, 3.5 mm audio jack. Other important features are its 2MP camera for conference calling, a fingerprint sensor integrated into the power button, and a 47Wh battery. 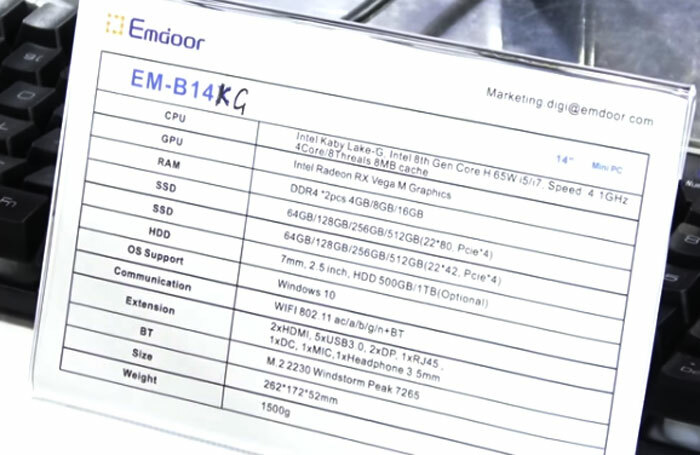 Liliputing notes that Emdoor operates as an OEM/ODM that manufacturers devices which will often be sold under other brands.